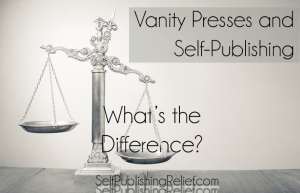 Some people use the terms vanity press and self-publishing as if they are interchangeable. Unlike traditional publishing, where the publishing house covers the cost of bringing a book to market, with self-publishing and vanity presses it is the author who takes on the financial risk for getting his or her work published. But in many important ways, self-publishing and vanity presses are very different. 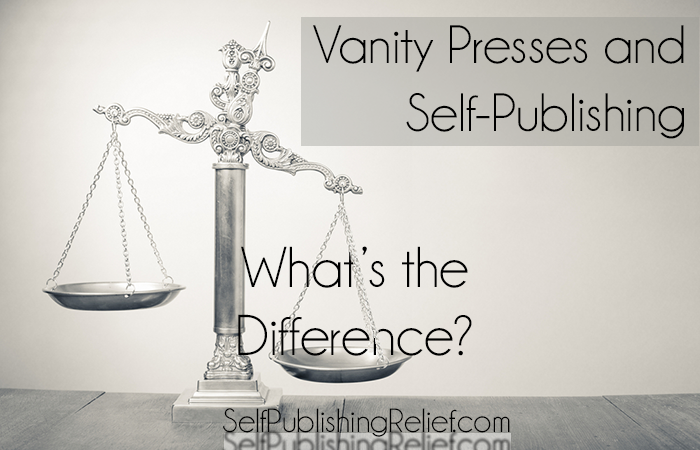 The core difference between self-publishing and vanity presses is who controls the publishing process—from editing and proofreading, to layout and cover design, to printing and distribution, to marketing and promotion. In self-publishing, you, the writer, control every stage of the process; with a vanity press, they do. As a self-publisher, you apply for and own the book’s ISBN number, and retain ownership of all rights to the book and its profits. You hire the copy editor to scrub the manuscript and arrange for the proofreader to give the draft a final read. 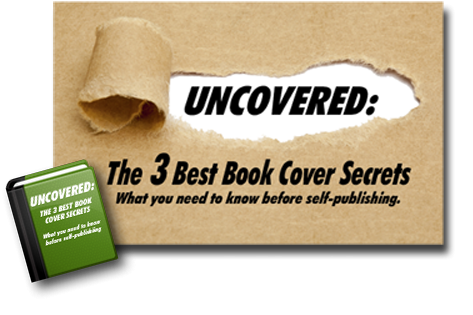 You design an eye-catching book cover or hire a professional to do it. You select the press that will print the book and assume responsibility for marketing and promotion. At each stage, you work out the terms with each service provider and you pay them for their services. If you’re unsure of how to navigate the self-publishing process, we can help. Self-Publishing Relief can guide you from manuscript to beautifully finished book. When you retain a vanity press, you give up control of the finished product and let the press make all the decisions about the publishing process. And with a vanity press, your contract may call for them to apply for and own the book’s ISBN number, so they may retain ownership of the rights to the book and any profits. Caveat emptor! When Should You Consider a Vanity Press? The book is intended for a specific, limited audience. Very few copies of the book will be printed. Perfection is not expected and mistakes in text or layout can be tolerated. Making money from sales of the book is not one of your objectives. 1. Greater Expense: Even if a vanity press were to produce a book similar in quality to one you self-published (which is unlikely), you’ll no doubt end up paying more than if you self-published. The vanity press is a middleman after all, and middlemen always get their markup! 2. Potential Loss of Ownership Rights and Profits: Depending on the contract terms, it’s possible that the vanity press actually acquires rights to your book, so any profits from books sold go to them and not to you. If you are considering working with a vanity press, make sure you read the contract carefully—and consider having a lawyer read it too. 3. Higher Likelihood of Mistakes: When using a vanity press, you rely on their editors and proofreaders. Remember: The quality of your final manuscript will only be as good as the editors and proofreaders—and you’ll have no control over these issues with a vanity press. 4. Ceding Creative Control: If you self-publish, you or your carefully selected designer will have a vision of what your book should look like. You’ll agonize over whether an image on the cover should be a bit larger, or whether a different style font might enhance the title. A typical vanity press won’t offer you the same attention to detail. If, when you finally have your printed book in your hands, you’ll be satisfied saying, “Well, it may not look very good, but it’s done,” then a vanity press might suffice. But if you’ll only be happy if you can say, “Wow, I am so incredibly proud of this,” then self-publishing is the right choice for you. QUESTION: Have you ever used a vanity press? If so, how was your experience?